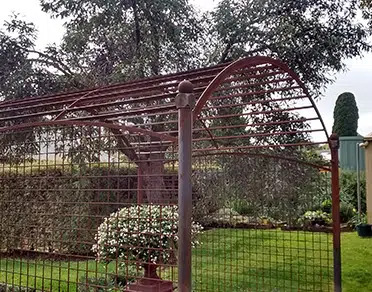 Garden arbour, also referred to as a trellis, is a framework that is traditionally positioned at the entrance of a garden. 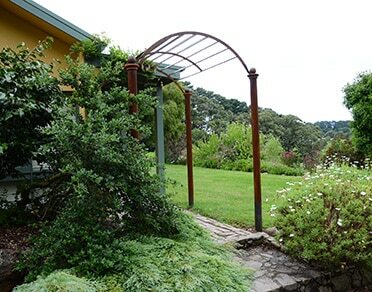 It can also be used to create shade in the garden and lead from one section to another. Often understated, this outdoor furniture blends well with the surrounding garden. 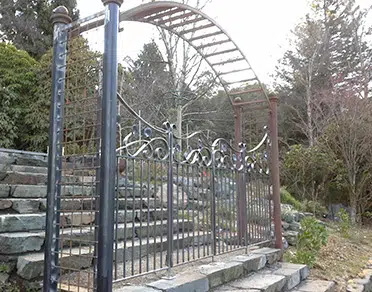 Red Hill Wrought Iron custom make garden arbours to suit any setting, combining your personal style and taste. Such outdoor furniture can be hand forged in a myriad of sizes, from short to tall heights and, in addition, in a variety of widths to fit the space you need occupied. 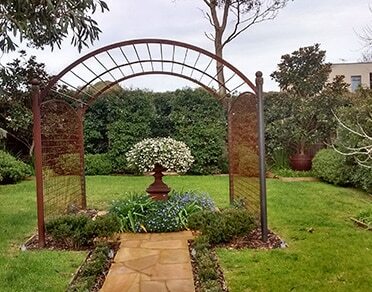 A garden arbour has many uses. 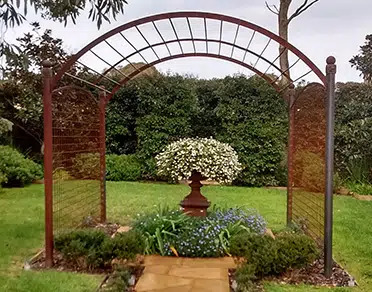 For example, they can be used to grow roses, climbing vegetables such as beans or espalier fruit trees, plus they are often positioned as a feature in the garden. 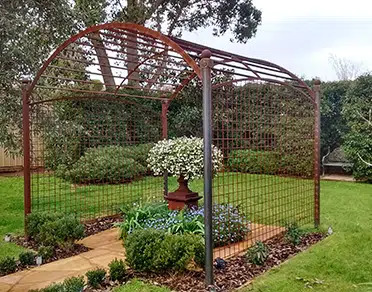 Red Hill Wrought Iron has hand crafted multiple pieces for the one garden, and they can be positioned at opposite ends of the garden or close together. 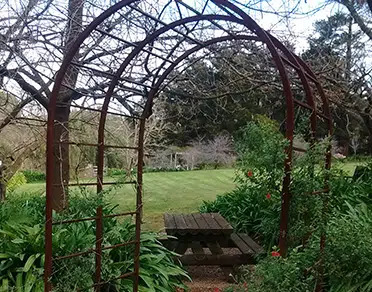 Either way, a garden arbour is an attractive feature and is practical in the summer time as a means of shade. 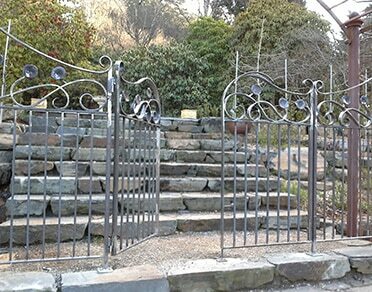 We hand forge garden furniture into beautiful wrought iron pieces. Our garden furniture boasts heavy gauge material, to ensure longevity of the furniture so that gardens looks fresh for years to come. 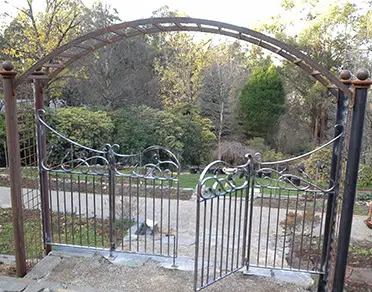 Red Hill Wrought Iron can design a decorative garden arbour to your requirements. We can also design with minimal amount of detail, depending on your personal preference. Of course, we will present you with sketches of bespoke furniture prior to commencing work in our artisan studio. It is important for us to capture your interests and the look you are tying to achieve so that the final piece is reflective of what you want. The choice of finish is also at your discretion. It is fashionable to showcase pieces that are finished in antique rust. 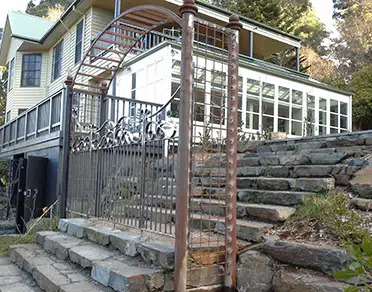 The popularity of this appearance comes from the fact that it gives an impression that it has been in the garden for a number of years. © 2018 Red Hill Wrought Iron. ABN: 99 746 495 767 All Rights Reserved.